Publisher: Disney Interactive Studios, Inc., Square Enix Co., Ltd.
What mattered the most was remembered the least. Follow Roxas through his days in Organization XIII as he searches for purpose in the life he was never meat to have. Will he find it in the Keyblade he wields? Or is the real key the fourteenth member of the Organization who slowly changes his life? 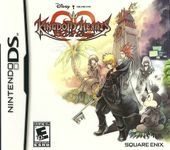 Dive into the heart of the most sought-after secrets in the KINGDOM HEARTS storyline. Action-packed gameplay and your favorite Disney worlds unite in another unforgettable experience! Experience all-new features, including the series-first multiplayer mode that allows up to 4 players to cooperate and compete in over 90 missions!